Xanthan gum is a product of fermentation industry. It usually derived from a variety of sources such as corn, starch or soy. Xanthan gum was mainly used in the oil drilling industry in the early years, and only 30% of it was used for food. In 1970s, its main use has turned to food, accounting for 60%~70% of the total output. In 1969, FDA in the United States took the lead in approving xanthan gum as a food additive. In 1988, China also approved the xanthan gum as a food additive. According to the Canadian Health Ministry website, the authority issued notices and approved the uses of locust bean gum and xanthan gum in mincemeat. Xanthan gum is accepted as a safe food additive with E number E415. As thickener e415, 1% of the xanthan gum can produce a significant increase in the viscosity of a liquid. At the same concentration, the viscosity of xanthan gum is 100 times that of gelatin. Using xanthan gum in baking can make the pores in the product uniform and elastic, and help to keep the taste of water and soft, and prolong the storage period. This powerful thickening agent also has uses as a stabilizer to prevent ingredients from separating. It is very safe, so it can be used in all kinds of food. Xanthan gum is used in large quantities to thicken drilling mud in the oil industry. The wide use of horizontal drilling and the demand for good control of drilled solids make it popular in use. In November, in terms of production costs, a strong rise in corn in Northeast China. Xanthan gum is usually made by cornstarch. Due to the quality advantage and supply - related reasons, the price of corn in Northeast China has been rising. 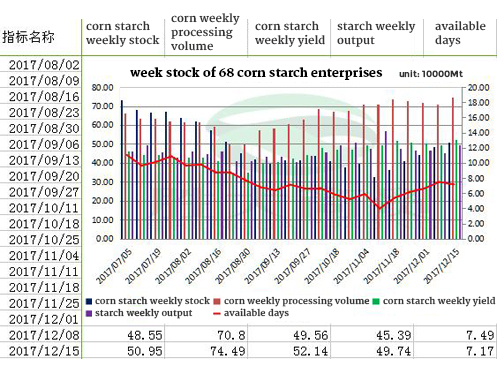 From the following data graph, there is an overall reduction of cornstarch weekly stock, and the corn weekly processing volume increases from September. From the downstream demand, the expansion of industrial corn consumption has become an important factor in the expansion of Chinese domestic corn consumption in 2016/2017. With the Chinese domestic corn acreage reduction and the continuous expansion of domestic corn consumption, the relationship between supply and demand of corn is changing in China. Will the xanthan gum rise in price next year? After analysis, it is possible to rise in price next year. And ChemBnB offers xanthan gum food grade and industrial grade for group buying price this time. ChemBnB is a group buying brand under OKCHEM. It can help the group buyers get high quality products at lower price. We can provide certifications and factory audit report, xanthan gum halal, etc.